Edge of Empire. A series of novels by Dory Codington whose stories take place in Colonial, Provincial, and Revolutionary America. It’s June again and that means it is wedding season, and that means dancing. In New England a wedding was a secular affair, more often performed by a justice of the peace or the town magistrate than a minister. 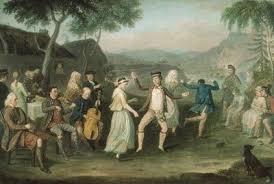 That changed over the eighteenth century, as did dancing at weddings. Alex followed the sound of a fiddle toward the front parlor. Furniture had been pushed against the walls, and all the larger pieces had been removed. The tall windows facing the flower garden were open, and the smell of roses wafted into the room on the slight breeze. Guests were just beginning to take their first hesitant steps as the musicians began to play. Dancing at the Parker house was a surprise, even though it had been hinted at. As with the cardroom, he could see that tradition was fading, and old prohibitions were falling away. 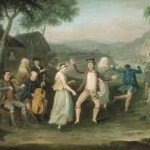 Still, he was happy to see a reel danced, and a fiddle and pipes played. Someone grabbed his hand and he was pulled into a line. He bowed to his right, his left, and his partner in the opposite line. His feet barely needed his brain to remember these steps. The simple reel allowed his mind to wander, so he watched the dancers. Most were having to concentrate very hard not to fall over their own, or their partner’s, feet. A general sigh of relief was given when the dancers began their promenade up the line and around. As the dance steps began their repeat, a woman giggled. The others caught the enthusiasm and laughed at their own seriousness. The second set was far more lighthearted. In a few minutes they had gathered an audience. Some looked on, shocked and surprised at what the younger generation had gotten up to. Others tapped a foot in time to the music, captured by the beat, maybe looking for a chance or the courage to join the dancers. Alex realized with some surprise that he was having a good time. He liked the shocked look on some of the faces, and the admiration on others. The reel concluded, and the dancers reformed into groups of four. Alex took a moment to catch his breath. He stretched his back and looked around, taking a minute to make sure he hadn’t done anything terrible to his leg. He turned, and there was Nina, standing by the window as if she had only just walked through. She was one of those tapping her foot to the opening bars of the next set. He reached out to pull her into the dance. “You know I have no idea how to do this.” Nina felt ridiculous as Alex held her hands and led her around the small dance floor. It’s June again. The piles of snow left from last winter are finally gone, and the roses, (which did not mind the snow mounded on their roots) are in full bloom again. These luscious blooms were the motivation for a scene in Beside Turning Water when Nina rests in the rose garden at the end of a beautiful summer day. 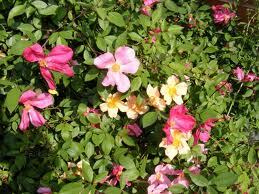 Nina slipped back out of the long windows toward the rose garden. She found a bench in the flowers and gratefully sat. Her legs felt weak, she felt flushed and her heart was beating in a most uncomfortable manner. She blamed the dancing, but sitting there in the warm summer afternoon, she grudgingly admitted to herself that Alex, her intrepid rescuer, was the culprit. She had sworn off men so many years ago, vowing never to marry again. She assured herself that her short marriage inoculated her, had left her safe from the risk of future discomforts – physical and emotional – that being married would bring her. It was as well she would leave, and he would go back to Cambridge. This time, truly, she would never see him again. She concentrated on the beautiful roses. In the warm dry weather of the last week, the flowers had bloomed early and now waited, suspended in glorious splendor, their petals open so far they nearly drooped. A few had already stopped trying to hold on, and masses of color littered the nearby ground. It was clear from some empty stems that the flowers that had been fresh and pretty this morning had been cut for the ceremony, or for the party here at the house. 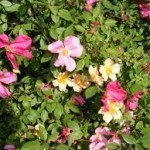 She scooped a handful of pale purple and yellow petals into her hands. She inhaled the heady scent. Alex, too, had enough of dancing and polite pints of ale, good as it was. He had had enough too, of wondering where his Nina, the mysterious blonde, had gone. He found Wythe at the card table and wearily told him that after he picked up a book, he could be found somewhere between Angier’s Corner and the encampment in a dark tavern, getting very drunk on what would probably turn out to be very bad ale. He expected to drink beer that had been sitting too long in a leaky keg. He discovered he felt uneasy and incomplete. He did not know why. It would seem to be a strange reaction to a lovely country wedding. He whistled for Thorne, and synched his saddle into place. He gazed over the paddock. The two Suffolk Punches were still there. That was odd – he hadn’t seen a workman or a delivery fellow. He didn’t think the Parkers farmed their own land or if they did, he didn’t think they would stable the work horses at the house. Well, curious as it was, it was not his mystery. He led Thorne around to the side so as not to trample on the flowers. He stopped. Staying out of sight of the lady on the bench, he watched her drink in the scent of spent roses. He allowed himself a daydream. In it, he walked up to her, took her in his arms, and lay her back in the grass, so warm and open in the summer sun. Sweet and willing like those voluptuous roses, she would stare at him with the same rapt expression he saw on her lovely face. Alex shook himself. He shouldn’t think such thoughts about her, jealous as he was of those rose petals. She might be married. After all, she wore a small ring, and she had a name different from the one Wyeth told him. However, if she were well wedded, where was her elusive husband, and why had his name not come up? No, she would not be married. A woman that lovely, if she were wed . . . she would have the air of satisfaction, the roundness of a child or two. She had none of that. She would, though, if she were his wife. Not having a clue where or why such a thought arose, he shook himself again. It must be the smell of the roses. Copyright © 2019 Dory's Historicals. All Rights Reserved.